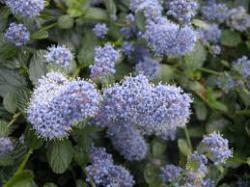 This is one of the hardiest and most reliable of the Ceanothus, Low Blueblossom, or also known as Creeping Blueblossom, will grow in difficult areas. It is a low growing 1-2 feet x 4-15 feet, evergreen shrub, that is smothered in powder-blue flowers from May to June. Grows best in any reasonably fertile, well-drained soil in full sun, although it will tolerate some shade. It will survive in sand or clay and is fairly drought tolerant, so will be okay in a coastal area. Plant in full sun or light shade on the coast. In hotter interior areas, protect it from the heat of the afternoon sun by planting it in light shade or in morning sun. Low Blueblossom is tolerant of most soils, but prefers good drainage. Once established, creeping Blueblossom will survive the summer with no supplemental water, but is tolerant of irrigation. In hotter areas, an occasional deep watering in summer is beneficial. Little maintenance is needed. If necessary, prune lightly to maintain a neat compact shape or to control the size. Hardy to 15 degrees F.